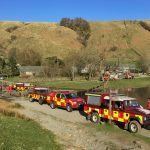 Incident Details: The Team were asked to assist Cumbria Fire and Rescue Service dealing with a large grass fire on the slopes of Brund Fell and Grange Fell. Initial reports suggested a very wide fire front, and a large number of appliances were drawn from across the county to deal with it. 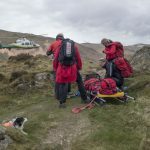 Team members were tasked to support fire crews with local knowledge, providing logistics support and welfare, and being on hand in the event of any injuries. They also spotted for the crews, trying to locate the areas where the fire had spread in the complicated topography. Fire chiefs requested the assistance of the northern police helicopter, which lifted a Team member to give clear directions as to where the fire needed tackling, though by this time, most of the fire had been either beaten out or had died out of its own accord.